These pages do not want to be a travel guide to Australia. They are just little news flash that can help you understand the strange country. Because Australia is completely different from how we can normally imagine and consider it in Europe. Much has been written of the South Seas, but this book is one of the most compelling records of a life spent for the most part under the equator that has yet been written. It reveals a new world of adventure that is amazing to contemplate. Your essential guide to budget travel to top Australian destinations. Find cheap hotels and travel tips for Sydney, Melbourne, Brisbane, Perth, Adelaide, Whitsundays, Tasmania and more. Plus, meet the Australian legend that is Warwick Capper. Sydney is one of the most multicultural cities in the world. 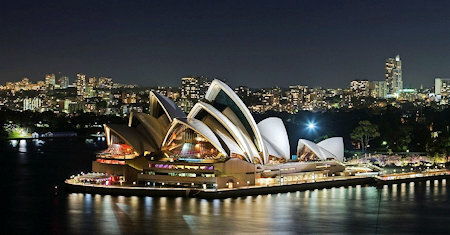 It is home to the iconic Sydney Opera House, the Harbour Bridge and its beaches. The metropolitan area is surrounded by national parks, and contains many bays, rivers and inlets. New Zealand is a country of stunning and diverse natural beauty: jagged mountains, rolling pasture land, pristine trout-filled lakes, raging rivers, scenic beaches, and active volcanic zones. These islands are one of Earth's most peculiar bioregions. Located between Melbourne and Sydney, Canberra is Australia’s capital and largest inland city of the continent. This guide contains descriptions of the main attractions of the city. It further provides you with general information about Australia. Melbourne is Australia's cultural capital, with Victorian-era architecture and large parks and gardens. It is a huge city with several district articles containing sightseeing, nightlife and accommodation listings -- have a look at each of them. Australia Eguide is a project with the simple aim of providing the most comprehensive Australia travel information available. Our team have worked hard, travelled all over and now able to offer this Eguide as a single document.